CSIRO's Australia Telescope Compact Array at the Paul Wild Observatory. 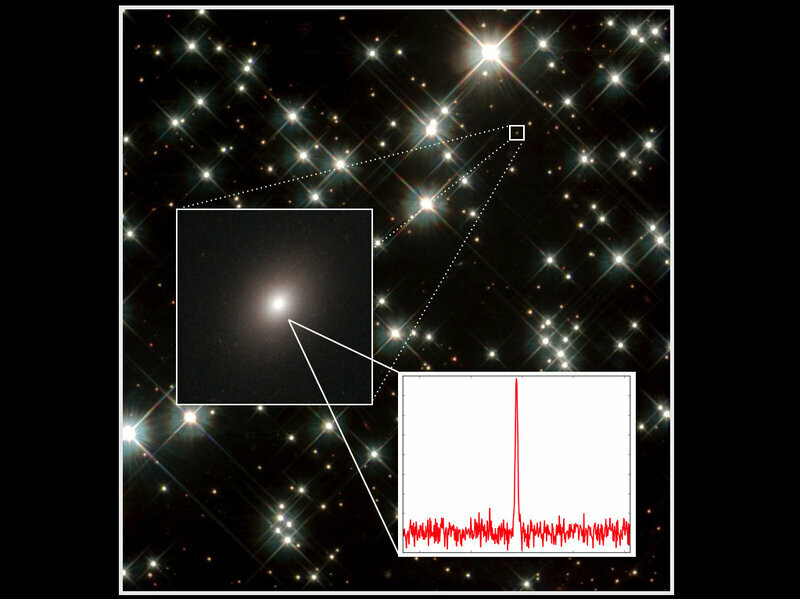 One of the most puzzling astronomical discoveries of the last decade has just gotten a little bit clearer. Astronomers still don&apos;t know what&apos;s producing the brief, powerful bursts of radio waves they&apos;ve been detecting, but for the first time, they&apos;ve been able to see where one of them is coming from. 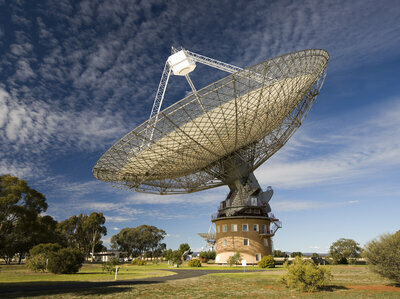 Astronomers first detected these so-called Fast Radio Bursts in 2007. Until now, all 16 FRBs that have been reported have all been found by combing through archival data. But Evan Keane, an astronomer with the Square Kilometer Array Organization, says he and his colleagues wanted to catch one in the act. That way, they could point other telescopes in the direction of the FRB to search for clues about its origin. So they piped data from Australia&apos;s CSIRO Parkes radio telescope into a supercomputer at the Swinburne University of Technology in Melbourne, Australia, so that it could sift through the information in real time. On April 18, 2015, they got a hit. It was only the 17th FRB ever reported. "I was in South Africa when it happened," Keane says. He&apos;d been in a long engineering meeting the day before and had been planning to sleep in that Saturday morning. "But of course, my phone started going crazy in the morning" with people calling to say the computer had found an FRB. They called it FRB 150418, for the day it was found. Keane and his colleagues immediately alerted a network of telescopes they had assembled around the world to help pinpoint and characterize an FRB if and when they found one. The Australia Telescope Compact Array at the Paul Wild Observatory was able observe the radio "afterglow" from FRB 150418. ATCA is an array of six 22-meter antennas used for radio astronomy, and it was able to localize the source with a thousand times the accuracy of the Parkes telescope. Then, the Japanese Subaru telescope took up the search. Subaru is a large optical telescope located on Mauna Kea in Hawaii. It was able to see the patch of sky where ATCA showed FRB 150418 had come from. "There&apos;s only one thing there," Keane says, "and it&apos;s a galaxy, an eliptical galaxy." An elliptical galaxy 6 billion light years away. Unfortunately, Keane says, knowing that doesn&apos;t explain what&apos;s generating the massive pulse of radio energy. But knowing how far away that object is lets you do some extremely interesting calculations. That&apos;s because the different frequencies that make up the radio burst don&apos;t all arrive at the exact same time. The longer frequencies are delayed. "And the reason for that delay is the stuff that the signal has gone through — the particles and dust in the intervening space," Keane says. And by measuring the delay, you can measure how many particles there are between us and the galaxy. And knowing how many particles there are between are between here and a galaxy 6 billion light years away gives you an estimate of how much that slice (or cylinder, if you&apos;d prefer) of the universe weighs. Although what&apos;s generating these FRBs is still a mystery, the new discovery gives some hints. Keane says the galaxy where the FRB originated is comprised mostly of older stars. "Our conclusion [is] that FRB 150418 is likely to be from a one-off event in an older stellar population," he and his colleagues write in the journal Nature, in a paper describing the find. Keane&apos;s organization, the Square Kilometer Array Organization, is designing a giant radio telescope that should be able to detect lots more of these FRBs. Maybe enough to figure what&apos;s making them. And before you ask, there&apos;s no good evidence that FRBs are being generated by extraterrestrials.